When you hear the word “Nazi” don’t think jack-booted thugs, mass murder of civilians and Jewish extermination camps, think breakdown of the rule of law, destruction of individual rights, and silent obedience to authority because they came before the final endgame. These same trends that led Germany and Europe to the abyss in World War II are visible in America and the Western world today. Naomi Wolf’s “The End of America” is a must read. Watch her talk about the book in this 2007 lecture, and read her article ‘Fascist America, in 10 easy steps.’ Her book came out during the late stages of the Bush era. It was clear by then that the Executive Branch is in charge and Congress is ceremonial. Nothing has changed under President Obama. It will take a country to rebuild America’s core institutions and constitutional laws, not one president. The cruel joke is that the President is not on the side of the American people, the rule of law, and freedom. Obama is not interested in saving America’s constitutional republic. He is in contempt of Congress and the Constitution along with the entire political elite in Washington. The traitors who run the U.S. government want to surrender America’s sovereignty to a dictatorial world government owned by criminal private banksters and traitorous oligarchical corporations that hate the free market and free competition. They are Nazis in the sense that they believe big government and big business should control human life and manage the global economy in a centralized and dictatorial fashion. If there is going to be a reversal to American decline and Western decline then it has to come from the bottom, not from the top, from the periphery, not from the center, from the people, not from the oligarchy. The first step is recognizing that the heart of Western politics has been taken over by a criminal oligarchy that wants freedom to die and all nation states to perish into history. Obama and the two-party establishment in America are in line with this hidden, undemocratic goal. A culture of obedience to authority in Nazi Germany produced mass death and mass destruction. America is more likely to be delivered from its evil totalitarian government because it was founded by thoughtful revolutionaries. The American people have never embraced obedience and authority for their own sake because deep down they know protecting individual freedoms is more important than following government orders. Everything good that has been achieved by mankind has been a result of disobedience, and of conscientious rebellion. America’s revolutionary tradition is alive in people like Alex Jones and Ron Paul. Alex said yesterday that America is the Nazi Germany of the 21st century and he is dead on right. The U.S. government was hijacked by Nazi sympathizers and a criminal ruling elite. It is not a coincidence that George Bush’s grandfather was a financial supporter of the fascists in Europe. These rats didn’t disappear from history, they just learned to hide their evil designs from the people behind a well-oiled propaganda machine in Washington. President John F. Kennedy was not killed by a looney lone assassin. He was murdered by criminal factions who control the CIA and the entire apparatus of the United States government. Their murdering ways have continued for half a century all around the world. After killing one of America’s most promising presidents five decades ago they are now prepared to destroy the American experiment in liberty, and bring America under a North American Union that is designed to be connected to a one world totalitarian government. If you are not convinced that America is run by traitors, thieves, and Nazis, below are ten characteristics that the Nazi government in Germany and the totalitarian government in America have in common with each other. 1. Use of False Flag Terrorism: It is a known fact that Hitler staged the Reichstag fire to increase his power, and create popular support for his wars and discrimination policies. This tactic is commonly used by all sorts of governments: democratic governments, totalitarian governments, and religious governments. The U.S. government has used false flag terrorism to start wars and make people fear for their lives for a century or so. The two most famous false flag attacks are the Gulf of Tonkin incident and the 9/11 attacks. 2. Use of Preemptive War: Hitler’s assault on Europe began as a vision in his mind. He was never on the defensive. The same is true for the neocons’ assault on the Middle East. America is not fighting defensive wars in Afghanistan, Iraq, Pakistan, and Libya. The U.S. government is the aggressor, invader, and occupier. Throughout history all criminal aggressors have been beaten and destroyed because aggression invokes the self-defense instincts of good men. The men who are resisting U.S. occupation in Iraq and Afghanistan are not “terrorists” but heroes of their land. 3. Indoctrination of Children: This is where it gets weird. 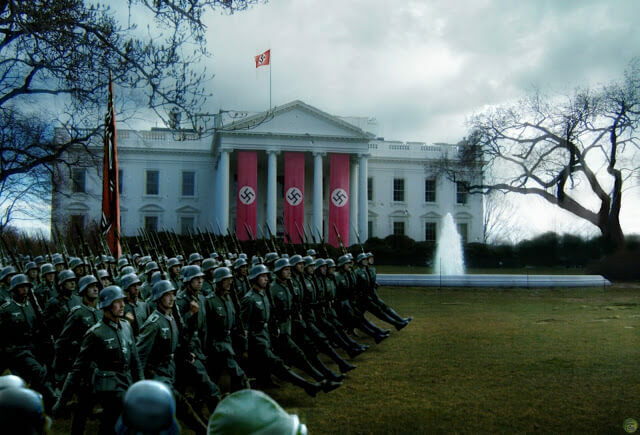 The current U.S. government is following in the Nazi government’s footsteps by brainwashing government agents as young as fourteen into believing that America is threatened by “right-wing extremists” and fed-up military veterans. In May 2009 the New York Times published a story called “Scouts Train to Fight Terrorists, and More.” I see the picture in that article and I don’t think “great defenders of the law” but “army of death.” Hitler, like all tyrants, knew that when you build your army to conquer the world it is better to take troops while they are still young and impressionable. It is sickening that the U.S. government is following the same procedure. 4. Creation of Goon Squads And Secret Police: The TSA is a goon squad. It can only justify its existence by hyping the non-existent terror threat. But they are mild lab rats compared to private security guards, and the military police who will be activated once society breaks down and martial law is declared in America. The police and military in America have been trained and taught to do one thing: Kill The Enemy. They have been told to forget search warrants, the Constitution, and the rule of law. And who is the Enemy? Domestic terrorists, i.e. people who question the false narrative of 9/11, people who want to restore the U.S. constitution, people who want to end the private and foreign owned Federal Reserve Bank. In other words, patriots and freedom fighters. 5. Use of Propaganda, And Terms Like “Homeland Security”: Before any tyrant or group of tyrants can conquer the world they must first conquer the word. The art of rhetoric is not taught in school today because people would then be able to defend themselves against corporate and government rhetoric. The use of rhetorical propaganda to collectively brainwash the people and make them believe a false reality has been developed to a highly technical stage. Hollywood and the mainstream media are utilized by the Pentagon and the CIA to indoctrinate the American people and contaminate the culture with fake government storylines like the one about the 9/11 attacks. 7. Use of The Big Lie: It is easy to understand the immorality of totalitarian regimes if you begin with the big lie. Evil leaders think of themselves as above the people so they justify lying to the public on a grand-historical scale. The big lie about 9/11 is created and protected by criminal traitors like Philip D. Zelikow who have a totalitarian mindset and believe history should be stated managed. In the worldview of totalitarians like Zelikow, Bush, and Obama there is a dumbed-down history for the masses, and a higher history for the elite. This conception of the world is based in their belief that the masses don’t have a destiny, that they are here on Earth to eat, sleep, and work, not to decide government policy. Hitler had the same worldview. 8. State Repression and Intimidation of Activists and Patriots: When propaganda fails, the state’s repressive apparatus kicks in. Government agents in America and the West have been mentally enslaved and brainwashed into believing that the threat of terrorism is more dangerous than white collar crimes or government criminality at the highest levels. Intelligence agents and cops have been brought under the will of a criminal ruling elite and will be unleashed against “domestic extremists” and activists. If you resist the wars in the Middle East you’re considered a bad person. If you believe in freedom you’re considered an extremist. But don’t get mad at the cops and secret intelligence agents. They are trained to be slaves, to follow orders like dogs, to have no will and no independence. They don’t have any understanding of what has been done to America and the Western world. Read Kevin Gosztola’s article ‘Obama DOJ’s War on Free Speech & Activism,’ to learn more about the U.S. government’s suppression of dissent. 9. Demonization of Innocent People – Jews, Muslims, Christians (Right-Wing Extremists), Freedom Fighters: All tyrants and criminal governments dehumanize people before killing them and smear countries before invading, plundering, and occupying them. The Nazis dehumanized Jews to such an extent that it ended in genocide. Today, Arabs are demonized as “terrorists” to make their heroic resistance to occupation appear irrational and barbaric. The same tactic is being used against Americans who want to free America from the corrupt tyranny of the Federal Reserve, and anybody in the West who wants to get rid of the private banking occupation of Western governments. 10. Destruction of The Rule of Law And Civil Liberties: Breaking the law is the most barbaric act a government can do. A society goes to hell once it allows government officials to get away with breaking the law. What arises is Anarchy for the elite and Tyranny for the masses. This is the state in America and the Western world. But this two-tiered justice system won’t last forever. Anger and resentment will build up in the people over time until a tipping point in the crisis is reached when only a total revolution from below or a total war from above will resolve the conflict. Right now the evil traitors in the U.S. government are conducting a total war on the masses, which, according to Webster Tarpley, will culminate in mass murder and genocide. If a popular resistance movement within America does not rise to return the government into the hands of the people and restore the Constitution then the whole world will suffer a global tragedy. We live in dark, but also hopeful times. The future of mankind is up in the air. Either the oligarchical traitors who run the U.S. government will survive and rule the planet through a dictatorial world government, or the American people will recognize their crimes against humanity and peacefully overthrow them.